Virginia Marcs has worn many a musical hat. From Madonna-obsessed adolescent to opera singer turned swing band leader, none of them fit until she received her guitar - more than an instrument, it was a gift of permission. Known for her emotionally exhilarating vocals and raw storytelling, Virginia is a sought after indie-folk-rock performer, a regular on the Queens festival circuit and a member of the Astoria Music Collective. Fans compare her to Kate Bush, Tori Amos, Janis Joplin, Ani DiFranco and Adele. 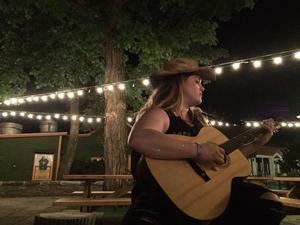 First recognized in 2016 in Idlewild Magazine, Virginia doubled down the following year, crowdfunding her debut album, Climbing the Wall, produced by Katie Buchanan. The record was heralded in Times Ledger and BORO Magazine. Notable recent performances include shows at New York City venues The Bitter End, Rockwood Music Hall and Bowery Electric as well as the Venus Envy, Astoria Music Now! Between Two Bridges and Turning Leaves Festivals. Marcs' upcoming EP, Reckoning, is slated for a summer 2019 release. The first single, dynamic and hopeful track, “I Need You,” was released on November 18, 2018 and premiered on Highway 81 Revisited. Emerging Indie Bands’ review of the single described it as having “ ... intricate melodies and immersive vocal … leaving the audience immediately desirous of more.” The music video, produced by Alexander Hammer, will premiere on February 2, 2019, the same day she embarks on her REUNITED Florida Tour.